I am using the web version of You Need a Budget (YNAB) after previously using YNAB 3 and 4. One of the big changes to the web version of YNAB is that credit cards are handled differently, as described in the YNAB 4 transition guide. The transition guide gives a story of going to buy a shirt, which you put on credit and have to pay back. It notes that you still need to pay it back, which comes later. That's all well and good. However, I can't wrap my head around how I'm supposed to actually use the credit card categories in practice. Say that I have $0 on my credit card at the start of the month (so no debt). Over the course of a few weeks, I make 20 transactions from 15 of my YNAB categories and create a total debt of $500. I want to pay it back in full. Go to each of those 15 budget categories and manually subtract the amount of money I spent, then add it to the "Credit Card Payments" category. Budget ahead of time how much I think I'll pay to my credit card into the "Credit Card Payments" category, and then hope that how much I spend is under how much I budgeted. So if I thought I'd charge $600 for the month, but I only charge $500 for the month, then I have $100 roll over to next month. The first option seems too tedious, and the second option seems like it doesn't really reflect the reality of how credit cards work. So how is the "Credit Card Payments" category supposed to work in YNAB? I've been using YNAB4 for the last few years, and I like it so much that I haven't switched to the web version (new YNAB) yet. However, I have played around with the web version a little, and here is what I have discovered. Despite the different look of the credit card account and the lengthy dissertation on the credit card differences in the Transition Guide, credit cards are handled almost exactly the same in the new YNAB as they were in YNAB4. You enter credit card spending transactions in the same way as YNAB4. When you enter a transaction, money is pulled out of the budget category you select. The only difference is that in YNAB4, this money was considered "gone." Now, that money moves from your budget category into the new credit card category. When it comes time to pay the credit card bill, you also enter this transaction in the same way as before. It is entered as a transfer of money from your checking account to your credit card account. The only difference here is that with new YNAB, the funds are deducted from your credit card category. This is handled automatically, so you don't have to think about it if you don't want to. If you always pay your credit card bill in full, you never have to budget money manually into the credit card category. The money will already be there from when you entered the credit card spending transactions. The only time you would manually budget money into the credit card spending category is if you have old credit card debt that you are trying to pay off. You can see that, just like in YNAB4, the credit card account is now in the red $100, and the checking account balance has not changed. 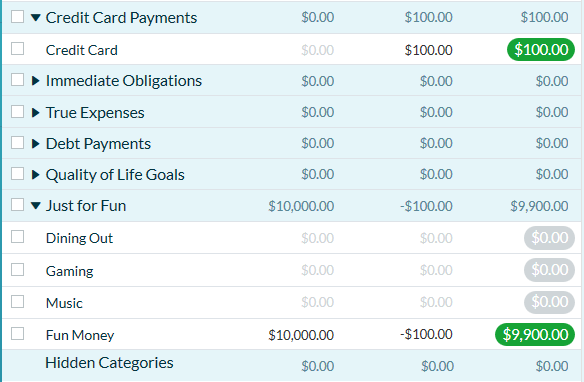 In the categories, my Fun Money category is down $100 to $9,900, just like it would be in YNAB4. The only difference is that there is now $100 in the new Credit Card Payments category. Note that the Credit Card balance is back to $0, and the Checking Account balance is now down to $9,900. The above example starts with a zero balance on the credit card. However, most people will have a non-zero balance on their credit card when they first start a budget. In YNAB4, when you added a credit card with a (negative) balance, the debt was shown in a budget category called "Pre-YNAB Debt." You then added money to this budget category until it went to zero, and then you didn't need this budget category anymore. 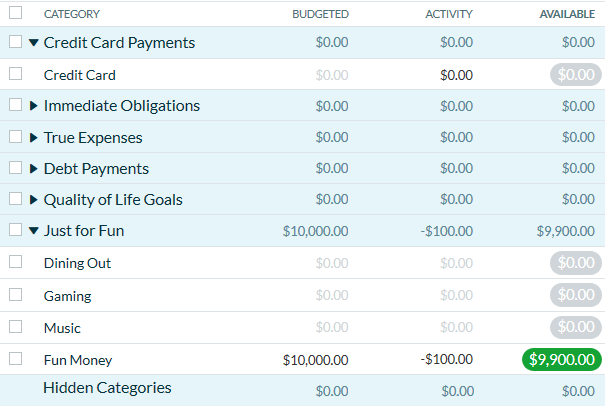 With new YNAB, credit card balances are not shown in budget categories. If you add a credit card account with a balance, the debt is not shown in the budget categories. To pay off this debt, you can fund the Credit Card Payments category. After this existing balance amount is paid off, you won't need to fund the Credit Card Payments category anymore as long as you properly assign each new credit card purchase to a funded budget category. Not the answer you're looking for? Browse other questions tagged credit-card ynab or ask your own question. I reconciled my credit card and now I need to budget money? YNAB: periodic payments to investment account for retirement? How do I make payments, or how should I make payments, on a credit card?